Who Asked Me? › Safe? I’ve often thought that the one thing standing between this page and the national recognition it so richly deserves is decent sports photojournalism. 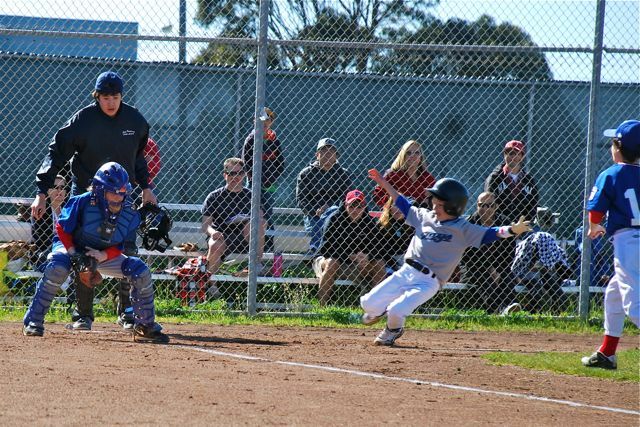 My brother took this shot of his nine year-old son Peyton, sliding home with obvious concentration during his Little League opener. Anyone who has ever played the game will take note of the kid’s form – staying just outside the baseline, both arms balancing his approach, eyes on the plate, etc. The real question is where he garnered this athleticism. Smart money is on my sister-in-law’s side of the family, as my brother and I, while not exactly oafs, never possessed this kind of deft ability. The scary thing is that the boy’s money game is actually soccer. He’s also a “man of few words” and when he took the call from his coach informing him that he’d made the team of mostly ten and eleven year-olds, the conversation on his end went like this: “Hello? Yes. Uh-huh. Um, shortstop and pitcher. OK. (pause) Daddy! Somebody wants to talk to you!” Gotta love a kid who keeps it simple. This was written by admin. Posted on Monday, March 15, 2010, at 6:59 pm. Filed under Posting. Bookmark the permalink. Follow comments here with the RSS feed. Post a comment or leave a trackback.